Eric and Leroy had left the previous afternoon, leaving Steve and I camped the last night outside the western entrance to Valley of Fire State Park in Nevada. Steve's flight out of Las Vegas wasn't until 1p or so, but he had no interest in doing some hiking in the morning before leaving. Rather than hang out with him, something I could do anytime back in San Jose, I made plans to meet up with Iris back in CA. To that end, I was up around 4:30a to slip out of camp and drive several hours back through Las Vegas to Baker, CA. I got there a bit early, but Iris was pretty much right on time at 7a. We then carpooled in the jeep out to the Silurian Hills for the third chapter in the last two months. Afterwards we found another hike to do in the Mojave National Preserve, making for a full day. It took us more than an hour to drive north, east and north again from Baker to reach our starting point in the Silurian Hills, very close to where Karl and I had parked only nine days earlier. Rainy weather had stopped our effort to reach the highpoint on that occasion, so today this was the main objective. I first wanted to visit Silurian BM, a lower point about a mile to the northwest. Though it lacks sufficient prominence to make LoJ, I knew that Gordon and Barbara had visited the point from the work I had done to get Barbara's records online. The third summit was about a mile and a half southwest of the highpoint, unnamed and really just a bonus peak to make the outing last longer. All told, the loop was around 7.5mi with 2,500ft of gain. The climb to Silurian BM was about a mile, quickly getting steep as we gained 1,400ft in that initial climb. We followed the vague WNW Ridge, class 2, taking about 40min to reach the summit. We found the expected MacLeod/Lilley register from 1980 though it was quite brittle. Surprisingly, there were 11 page of entries, though only a few from the usual suspects, including Wes Shelberg in 1982 and Mark Adrian in 1995, the most recent entry. The others were various military personnel, geology students and a few random visitors. Oh, and the 1934 benchmark, too. The ridgeline running southeast that connects with the range highpoint was a good one, providing nice views and an enjoyable, 1.5mi stroll that took us about 45min to complete. Barbara & Gordon had left a register here on the same day in 1980, but there was an older scrap from a 1978 visit by a Daniel Phillips from Arcadia, CA. The most recent visitors had been Matthew Hengst and Jen Blackie in 2014, both Sierra Challenge partipants from back in the day. 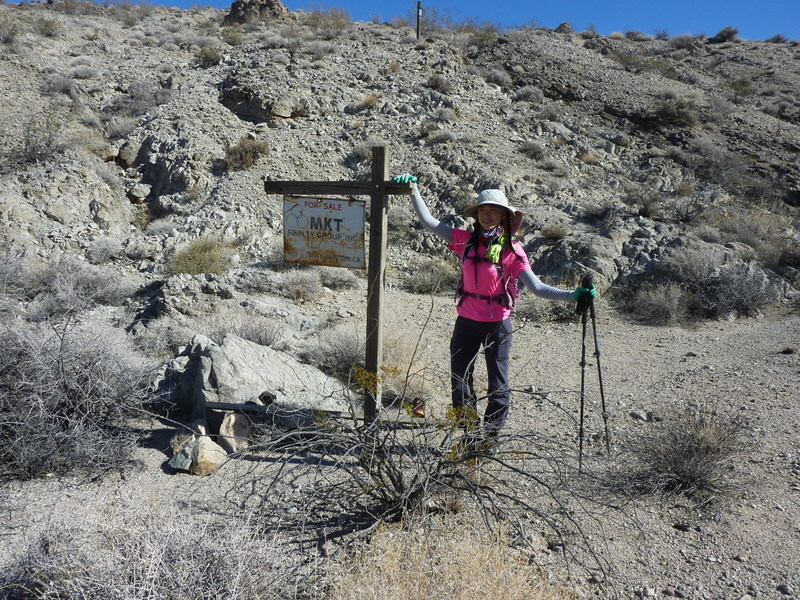 The segment between the highpoint and Peak 3,198ft was long, primarily because we had to drop all the way down to Owl Canyon which cuts through the range east-west. Owl Canyon appears to be the site of much activity in the past with an old road coming in from the east (this road may be the shortest route to the highpoint, btw, as it comes from the powerline road to the south that we had used earlier in morning). We were amused to find a For Sale sign in Cow Canyon's wash among other debris. A short distance to the west, we climbed out of the canyon where we saw equipment up the slope. It turned out to be part of a larger mining homestead that appears abandoned. The insides of several buildings had stuff strewn about, rat droppings everywhere - they had a field day with the bountiful dry ramen noodles that were stored in bulk - and general vandalism. As we continued south up from camp we came across a rusty bulldozer parked at the end of the driveable portion of the wash. Iris' efforts to commandeer it were for naught. From this point, our summit was another 30min of easy hiking up class 2 slopes. There are good views looking over the range from the top. We were two air miles SE of our vehicle at this point and it would take us about an hour and a half for the return. The going is pretty easy heading downhill to Owl Canyon for the second time, but we then had about a dozen minor washes to cross over against the grain. It would be 1:15p before we finished up. We headed back to Baker where we had a late lunch at the Mad Greek Cafe, Iris' first time at this iconic desert stop. While we were eating far more than we should reasonably have done, I was looking for something we could do in the area with the remaining afternoon. I hit upon a pair of easy summits off Kelbaker Rd, about 11mi to the southeast in the Mojave National Preserve. It would take us less than two hours for the 3mi loop hike. We had some trouble finding the access road that would allow us to drive up the small, shallow canyon between the two peaks. It was a bit circuitous and the roads were somewhat sandy, but it got us within about 1/3mi of Peak 2,759ft on its northwest side. We tagged this first summit before following the connecting ridgeline to Seventeenmile Point. We passed by the Oro Fine Mine site at the low point along the way, finding the Park Service had done a nice job of securing a few deep mine shafts. We reached Seventeenmile Point shortly before 5p, near sunset, finding the air growing quite chilly. We left a register here before heading down off the east side, eventually circling around to the south where we picked up the road we had driven in on. This was a pretty easy hike, but helped fill up the remaining daylight and then some.